In this sonification of environmental data we investigated the relationship between various parameters in air pollution. 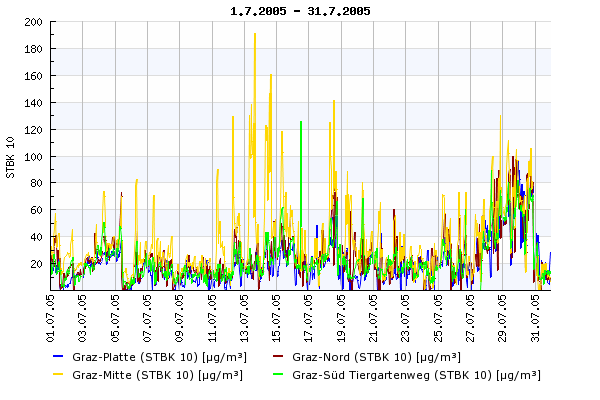 The data originated from the LUIS (Landes Umwelt Informations System) and contains measurements of particular matter pollution and rainfall at 4 monitoring stations in and around Graz. The goal was to reveal the inherent correlation between these two parameters and observe these over the time period of a month. The sonification uses parameter mapping and beacons to perceptualise the data. You get the SC3-code here; there is no external requirements, it runs on typical SC3 installations. A sound example of the sonification is given here. It gives one month of data, 3 types of markers (click per day, low pitch for week, high pitch for month). Particulate matter mapped on pitch, rainfall to noise. The raw data as available from LUIS giving rain data in july (as spreadsheet, JuliNiederschlag.xls).